That's how Queen's song said. And that sentence it's becoming usual in Bilbao, as more and more people prefers day by day a bicycle instead of a car. Bilbao it's not a place where bycicles fix fine to its roads. Lots of cars make it dangerous, and there are not too much special ways for them. But habits are changing and it can be seen on the streets. Cyclists are more usual, and there are also new ideas which are looking for reducing the number of cars in Bilbao, which is good for bycicles. One of those ideas is the one about transport shown these days in the Arenal. Some of the most popular bycicle factories have been there to sell their products. 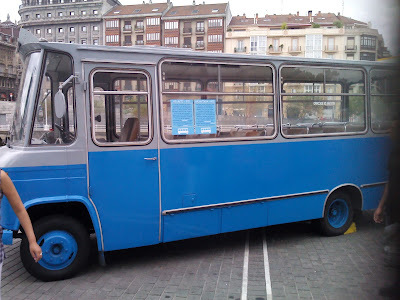 By the way, there's been a little kind of "musseum" about the history of transport in Bilbao. The picture will remind you of something that you'll probably know.